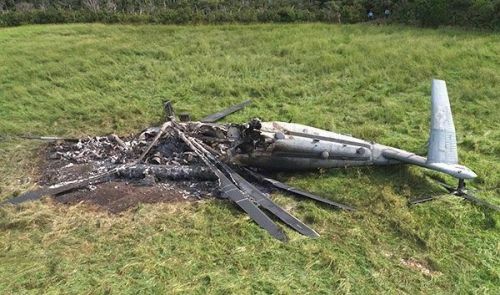 The wreckage of the CH-53E helicopter at 8:53 a.m. on October 12, 2017 in Takae, Higashi Village after the incident where it went up in flames. It came to Ryukyu Shimpo’s attention on January 21 that toxic substances such as the carcinogen benzene are present on the site where a CH-53E U.S. military helicopter went up in flames and came to the ground in Takae, Higashi Village in October last year. On January 11, the Okinawa Defense Bureau (ODB) explained this to the owner of the land upon which the incident occurred, 64-year-old Akira Nishime. However, the ODB did not provide any explanation about the levels of benzene or whether it was enough to affect the human body. Immediately following the incident the ODB collected a soil sample from the site and examined it, but the results have not yet been officially announced to the Okinawa Prefectural Government (OPG) or media outlets. According to Nishime, officials from the ODB came to his house on January 11 and explained that toxic substances such as benzene were identified at the accident site. They said that due to the detection of toxic substances, 300 cubic meters of soil would be removed, dug out one meter deep. Out of the 300 cubic meters of soil, 250 cubic meters will be treated in Okinawa, but the remaining 50 cubic meters cannot be treated in Okinawa and therefore will be transported to Osaka for treatment. Immediately following the incident the U.S. military hauled away a large quantity of the soil, five trucks’ worth. The OPG and ODB collected and examined the soil remaining after this U.S. military haul.